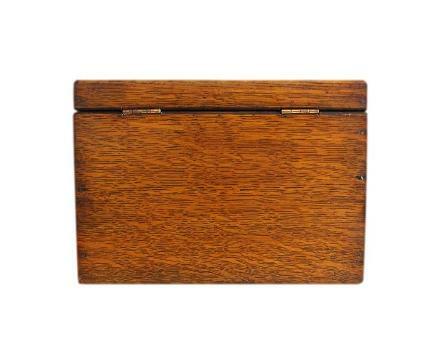 This is a wonderful quality antique box, made of solid Tiger Oak and with a newly refurbished interior. It started life as a small stationary box and has been converted for jewellery storage. 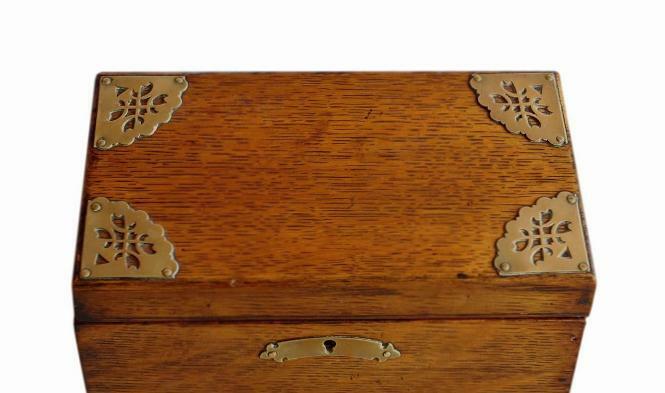 It is a wonderful piece of social history and has a decorative Arts & Crafts design. 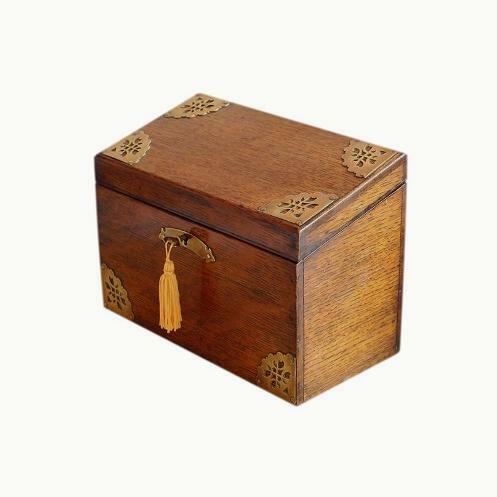 This box is made of solid Tiger Oak. This has beautiful characteristic stripes which gave this variety of Oak its name. The stripes are particularly prominent on the front of the box. The lid has a stylish sloping form. 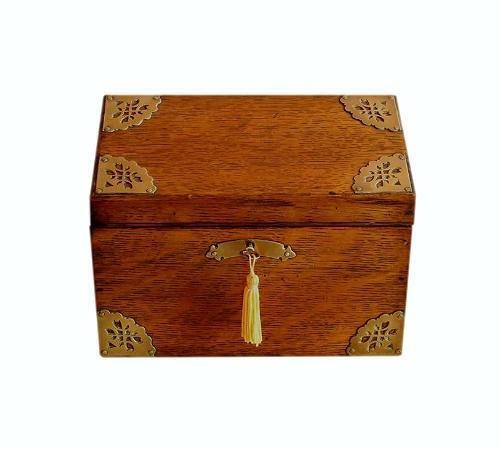 There are beautiful large solid brass embellishments to the lid and front of the box. These have a decorative pierced Oriental design and are fan shaped with scalloped edges. They are securely fixed with lovely flattened brass studs. There is a wonderful applied solid brass escutcheon to the keyhole. This has an elongated arch shape and is also securely fixed with flattened brass studs. The box is complete with its original working lock and key, and polished brass 'stop' hinges. These prevent the lid from extending too far back. 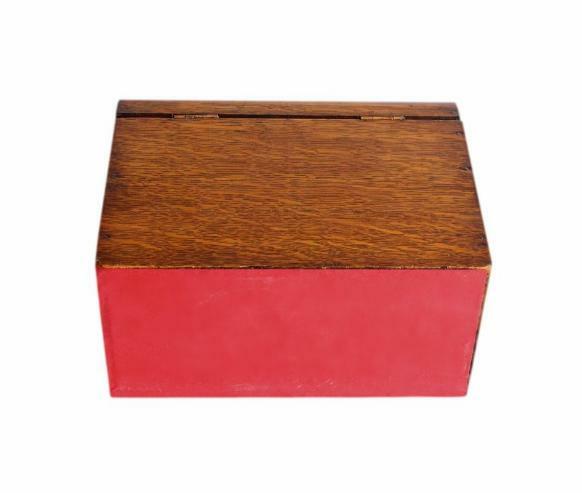 The bottom of the box has its original red paper covering. 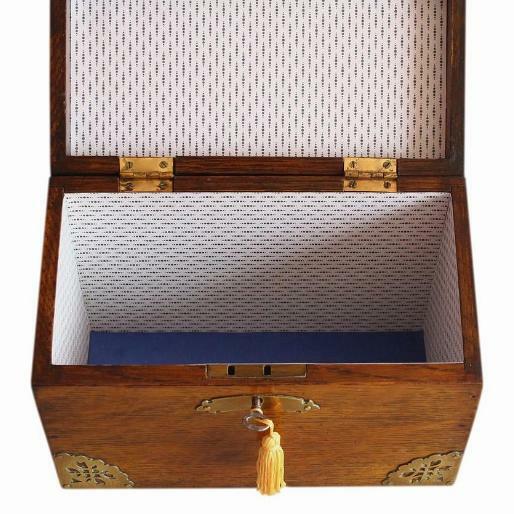 The interior has a single deep storage compartment and has been beautifully refurbished by our skilled box restorer. There is a new padded teal blue satin panel in the base of the compartment, and new paper linings to the interior walls and inside of the lid. The paper is ivory with a dark blue pattern and the pattern gives off a criss cross effect. Late Edwardian/Early Victorian. Circa 1890/1910. 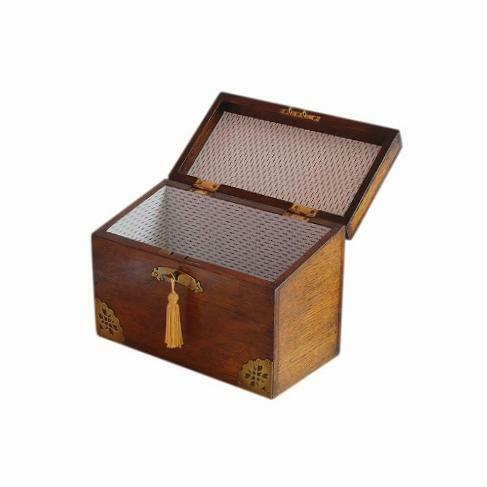 This fabulous box is in excellent condition for its age. The Oak has a very attractive rich colour and very little wear. The interior linings, being new, are in superb unused condition. There is some minor light friction wear to the paper covering on the bottom of the box.